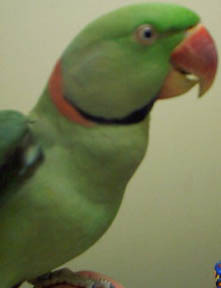 Temperament: The Alexandrine Parakeets are very independent birds, much like the other members of the Psittacula family. Although not often physically affectionate towards their owners, they do like to be interacted with and talked to. They love to play outside of their cage, but are also content to be in their cage playing with toys. They love to chew, so soft-wood toys are a must! Cage Requirements:	24" x 36"; bar spacing 3/4"
Interesting Facts:	This is the largest parakeet species, sometimes reaching over two feet in length. Their tails can sometimes be up to a foot and a half long! Natural habitat:	Forests and savannas in tropical lowlands; only occasionally at higher altitudes. Description: Crown and forehead black; lores green; throat and neck deep yellow; nape brownish-orange; back, wing, and upper tail coverts green; breast and abdomen white; thighs, flanks and undertail coverts yellowish-orange; tail gray with yellow tips above and olive below; eyes orange with bare, gray eye rings. Temperament:	The Caique is intelligent, curious and energetic. They are quite mischievous and can be destructive if not provided with appropriate toys. Caiques are acrobatic clowns who enjoy hanging, tumbling and rolling. Providing a well equipped playpen will help to focus some of the energy in these birds. They can be noisy and have a shrill whistling call. Cage requirements: 24" x 24" with bar spacing 5/8" to 3/4"
Interesting facts: Many Caiques develop the odd habit of sleeping on their backs--they appear quite lifeless until they suddenly scramble up to greet you! Temperament: These are the most common large macaw in pet stores and homes. They are incredibly active and playful, yet can calm down enough for a good head scratch. They are affectionate with their owners, but sometimes shy or aggressive with others. They are notorious chewers with their large beaks and very active, so many toys and a large cage is necessary. Cage Requirements:	36" x 48"; Bar Spacing 1" to 1 1/2"
Temperament: They are wonderful for first-time pet owners, or those who want to graduate to a larger bird. Pionus are ideal family birds, since they may be handled by several people and maintain their sweet disposition. They are not noisy birds and do not chew excessively, making them appropriate for apartment dwellers or thos concerned about noise. Blue-Headed Pionus are typically more shy around new people than the Maximillian's, but are otherwise very similar. Cage Requirements:	24" x 24"; bar spacing 5/8" to 3/4"
Natural habitat:	Light forest and open woodland; may be found in pairs or small flocks. Description : Green with some yellow through the green underparts; forecrown and head blue; white eye ring; pinkish-brown legs. Temperament : Conures are intelligent birds, with a reputation for being noisy and destructive. Both sexes are known to talk and perform tricks, and are loving and devoted companions. These bossy and boisterous birds have a very high energy level and can provide endless hours of entertainment. Due to their high energy level, many toys and a playpen must be provided to meet their activity requirements. Be aware that these are considered to be among the noisiest screechers of all parrots. Cage requirements: 20 x 20 inches; bar spacing 5/8" or 3/4"
Temperament	: These small parrots can talk, are not very noisey, and can learn to perform tricks, They make good family pets and enjoy being handled. their palyful nature makes the hightly entertaining both in and out of their cage. They should be provided with plenty of toys and a well-stocked playpen for time out of the cage. 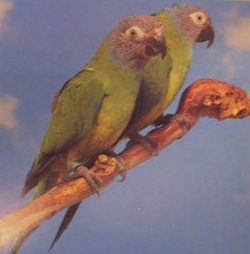 Brown-headed parrots are well suited for apartment living due to their quiet nature and relatively small size. Talking Ability : Moderate talking, and good at sound mimicing and whistles. Interesting Facts	: This bird is very similar to the Senegal parrot, as with all of the other Poicephalus. Each one has a different colored head, hence the name Piocepehalus (different, head). The Senegal has a grey head, the Brown-headed has a brown head. Both have a light green body, with yellow under wings. 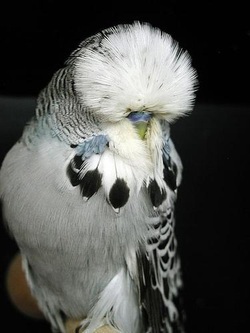 Descriptian The normal wild budgie is green with a yellow face and wavy black lines on the head, back and wings; several color varieties are available; ceres of all young birds are pinkish in calor, but adult males have a blue cere whiie females' are brown or beige. Temperament	Most budgies are playful, lively, and entertaining. They make excellent pets for first time bird owners and children. Although they can be quite sociable little birds, most do not enjoy excessive petting or cuddling. Hand-fed babies are especially tame and personable. Males can be excelent talkers. Some females may be able to talk as well and are generally more nippy than males, which tend to be fiendlier and more mellow. Interesting facts: The Guinness Book of World Records states that in 1958 a budgie named Sparkie Williams won a talking contest in England. Before Sparkie died, he could say 531 words and 383 sentences. Many anecdotes such as this are writen regarding the remarkable ability of the Budgie as a talker and great pet. Everyone should be so fortunate as to own a Budgie. Temperament: These birds can be hand tamed, but it takes a huge effort. Known for their beautiful songs and attractive colors, these birds make wonderful low maintenance pets. Be sure to give them a wide cage so they can excercise. Having just a single canary encourages them to sing more often. Cage Requirements:	18" x 24"
Interesting Facts:	Canaries are normally green in the wild!!! Description Broad, powdery feathers; head crest which can be raised and lowered; wide variety of colors: normal is gray with a yellow head and orange cheek patches; mature males and females are sexually dimorphic, the yellow and orange head of the male is much brighter than the females, and the underside of the female's tail is barred. Temperament: The cockatiel is a an almost perfect beginner's bird. They are gentle and docile, and have a friendly personality. Males can become good talkers and whistlers, and are more independent than females. Females tend to be quieter, more affectionate and often are more acrobatic. These birds are a good choice for children and also adapt well to the busy lifestyle of a working owner. They make wonderful pets without the time requirements and behavioral problems of the larger parrots. Interesting facts: The cockatiel differs from other birds in it's feather pigments. It lacks the modifiers of black pigments to produce blue coloration, and yellow pigments for green coloration. 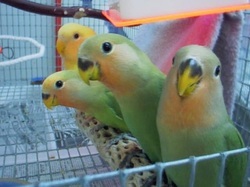 Therefore, preventing blue and green color varieties in cockatiels. Natural habitat	Forested plains. Birds go on foraging excursions to sparsely wooded savannas and to open country. Their distribution is largely identical to the range of the African oil palm, the fruit of which forms the bulk of the bird's diet. Description	Overall color is varying shades gray; bare skin patch around eyes; eyes of young birds are gray, but change to grayish-yellow in adulthood. Temperament	The African Grey is extremely intelligent, perhaps topping all other parrots in it's ability to learn new things throughout a lifetime. Adult greys are considered shy and introverted, and usually bond with only one person, being aloof with everyone else. They are also one of the most rigid and pattern oriented of all parrots, being keenly observant and sensitive to the slightest change in routine. Excellent talkers and mimics, these birds can accurately imitate specific human voices and household noises such as the doorbell, telephone, or microwave. As very empathetic and emotional birds, greys have distinct personalities and can be demanding of their owner's time and attention. Cage requirements	24 x 24 inches; bar spacing 3/4" Or 1"
Interesting facts	There is still some controversy over whether the African Grey parrot is merely a superb mimic, or truly understands some of what it says. These birds possess an uncanny knack for using words in a situationally appropriate manner, leading some people to believe they have the mentality of a three year old human child. 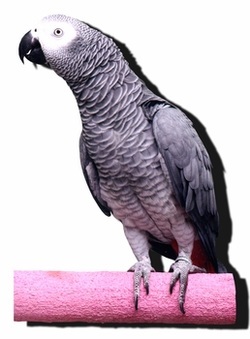 This belief is supported by an ability to problem-solve, as demonstrated by the famous grey parrot, Alex. Temperament: Double Yellow Headed Amazons are known for their intelligence and outgoing, playful nature. They easily learn tricks and various commands, and respond willingly for praise or a treat. They are very bold, and can be aggressive if not handled in an appropriate manner. A hand-raised baby makes a playful, yet affectionate bird. When mature, they can be temperamental, so previous amazon experience is helpful before buying one of these birds. Cage Requirements:	24" x 36"; bar spacing 3/4" to 1"
Interesting Facts:	Amazon parrots can be found as far north as Garden Grove, located in southern California. It is not known if these birds naturally moved north, or were at some point released, but average flock size is about 30 or 40 birds. They have survived quite well, as they have been repeatedly reported for over 10 years. 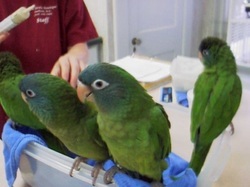 Temperament: These conures are much easier to handle than most others, as they are typically calmer and less aggressive when removed from the cage. They are still playful, but not to the same degree as their relatives, the Sun and Jenday conures. Though less playful, they also do not have the same powerful voices as their relatives. Cage Requirements:	20" x 20"; bar spacing 1/2" to 5/8"
Interesting Facts:	A few times we've had a clutch of three babies or more here at The Birdie Boutique, and we've noticed a peculiarity with this species. Every time we've had the babies, they would perch stacked up in one corner of the cage like a totem pole. This is the only species we've seen do this, and it's happened repeatedly in many different clutches of birds! Natural habitat	Low-lying plains, especially tropical rain forests. Description Male: Overall color green: underwing coverts and sides of body red; edges of wings blue; tail green above, with blue yellow and white markings and gray below; eyes orange; upper mandible orange; lower mandible black. Female: Overall color red; breast and abdomen with bluish markings; tail feathers reddish with yellow tips; wings brownish red on top; eyes whitish yellow; beak black. Temperament: These birds make wonderful, affectionate pets, and will learn to talk. They are gentle and mild-mannered, and somewhat shyer than other parrots their size. When they feel comfortable, they are playful, friendly, and easy to tame. Eclectus love to climb and should be provided with sturdy branches in their cage. Unlike most larger parrots, they are not destructive and do not usually engage in regular periods of screaming. Males are gentler, easier to tame, and make the best talkers. Females are more dominant, and some become bossy and nippy at maturity. Interesting facts: As both sexes are totally different in color (sexually dimorphic) it was thought for a long time that they were two species, until Dr. A. B. Meiljer of the National Museum of Natural History discovered in 1874 that the males are green and females red. It is also said that eclectus were once worshipped as sacred birds because of their gaudy colors. Description White body; sulfur crest; pale yellow under wings, tail and around ears; light blue eye ring; iris color changes from pale gray to black (males) or red-brown (female) after the second year. Temperament	Hand-fed cockatoos make exceptionally loving pets. They are both friendly and intelligent, and are very social, affectionate creatures. Natural chewers, cockatoos must be provided with branches or strips of wood. Some birds can be quite noisy, especially during the early morning and evening hours. Eleanora cockatoos may be less prone to developing behavior problems such as feather plucking and screaming than other popular cockatoo species. These birds love to cuddle and play, and can readily be taught to perform tricks. Interesting facts: The Eleanora Cockatoo is a sub-species of the greater sulfur-crested cockatoo. 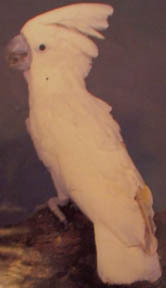 The Triton cockatoo who was featured on the TV show "Baretta" known as Fred is also a sub-species of the greater sulfur-crested cockatoo. 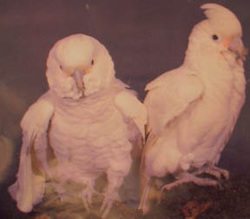 Temperament: The Goffin's Cockatoos are known to be very active and playful. They can be destructive, but due to their smaller stature they can't destroy large things very easily. Because of their playfulness, they need many toys to stimulate them, or else feather plucking could result from boredom. They enjoy time out of the cage, and make a wonderful cockatoo for those who can't spend 100% of their time with their bird. They are not typically aggressive, and can be quite cuddly at times. 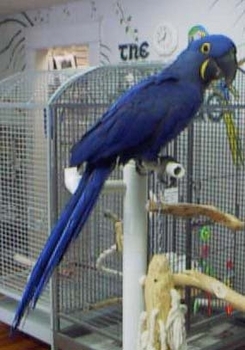 Cage Requirements:	24" x 36"; bar spacing 5/8" to 7/8"
Temperament: These birds are much calmer than their Blue and Gold cousins, but as babies they enjoy a much high activity level. They are usually more affectionate, and do require a large amount of time like the other macaws. Most people agree that these macaws are very demanding of attention and space, so they definitely aren't for everyone. Cage Requirements:	24" x 36"
Interesting Facts:	Though often mistaken for Scarlet Macaws, the Green-Winged macaws are very different both physically and mentally. They have no yellow on their wings and very prominent facial stripes. They are also quite a bit larger. They are not as prone to aggression as the Scarlets, however they still need to be handled correctly to prevent any unwanted behavior. Description General green plumage; reddish-brown forehead; crown and nape tinged with green; cheeks are green; ear coverts brown; sides of neck, throat and upper breast pale brown and tinged with green. the top side of the tail is a vibrant maroon. Temperament	This clever conure is extremely active, bold, and curious. Both mischievous and energetic, these chatty little birds can make delightfully spunky pets. They can be nippy and should be provided with a variety of toys to fulfill their activity requirements. Interesting facts	These small conures have a reputation as being extremely nippy around the time of weaning--don't worry, this stage does pass! Temperament: The Hahn's macaw, though the smallest of the macaws, still acts similar to the larger ones. They are bold and outgoing, and fairly intelligent. They can be taught many tricks, and love to perform for a head scratch or a treat. They can be nippy on occassion, but that can be minimized by daily handling and proper discipline. Cage Requirements:	24" x 24"; bar spacing 5/8"
Interesting Facts:	Often confused for Noble Macaws, the Hahn's macaws are actually a smaller species with slightly different coloration. Temperament: Hyacinth macaws are known to be the most gentle of all the macaw species. They are relatively calm, yet still playful in and out of the cage. They have incredibly strong beaks and jaw muscles, yet hardly use them when out of the cage. A hand-raised Hyacinth Macaw makes the ultimate pet! Cage Requirements:	36" x 48", 48" x 60" for larger Hyacinths. Bar spacing 11/2"
Interesting Facts:	Hyacinth macaws not only have yellow face patches and eye rings, but a pale yellow hue to all of their skin except their feet! Temperament: Like their Alexandrine cousins, these birds are very independent but enjoy being interacted with and talked to. They respond well with handling, and the more they are handled the nicer they become. Cage Requirements:	20" x 24"; bar spacing 1/2" to 5/8"
Interesting Facts:	Many color mutations are available; at The Birdie Boutique we've had the standard green, blue mutations, and Lutino (yellow) mutations. Natural habitat	Primarily mountain forests up to around 12,000 feet; occasionally found in tropical forests in the plains and on coffee plantations. 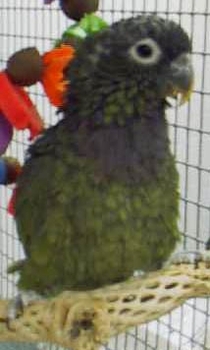 Description	Overall color green; forehead, bend of wing and thighs orange; head and back feathers black with dark green margins; lores, large wing feathers and tail black. 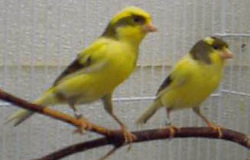 Young birds have gray eyes and lack orange markings; male adults have red eyes, females are brown. Temperament	One of the larger Poicephalus species, these birds are quiet, playful and enjoy being handled. They are well suited to the average family, but some have strong reactions to stress. They should be moved around the house so they are comfortable in all areas, and handled by several different people or they may become one person birds. Their relatively small size makes them a good choice of pet for the apartment dweller. Interesting facts: Poi means different, cephalus means head. Each member of the Poicephalus family has a different color head than their body. Natural habitat: Sparsley wooded savannas and trees along riverbanks. Description	The normal color is green with a peach to red face and a bright blue rump; many color variations exist. Temperament These tiny parrots are agile, acrobatic, and have boundless energy. They have cheerful personalities and love to play. Lovebirds are confident , assertive birds and although many are quite cuddly, others are very independent and not enjoy much petting. They are also chewers and must be closely supervised when out of the cage. Some have been known to talk, but in general they are not good talkers. Many people have been successful at teaching them tricks such as jumping through hoops, laying on it's back, or standing on it's head. These birds are also quite fearless and may challenge other birds and other pets, especially cats, in the househoid. Interesting facts	Contrary to popular belief, lovebirds will not die if not kept in pairs. Lovebirds are not called lovebirds because of their need for an avian companion, but because of their habit of huddling closely together. In fact, lovebirds kept in pairs can be quite intractable and difficult to tame. Therefore single lovebirds make the best pets. Temperament	The Maximilian's Pionus seems to have one of the nicest pet bird personalities. According to one breeder, "if ever there were a perfect pet parrot, the Pionus species certainly comes close to it." They are wonderful for first-time pet parrot owners, or those who want to graduate to a larger bird. Pionus are ideal family birds, since they may be handed by several people and maintain their sweet disposition. They are not noisy birds and do not chew excessively, making them appropriate for apartment dwellers or those concerned about noise. Interesting facts	In the wild, several Pionus species come from high-altitude forests that are low in airborne mold. Many of these Pionus were plagued with the fungus Aspergilus when the birds were first imported. 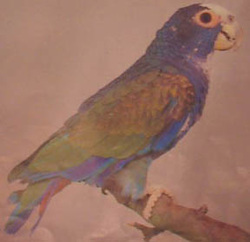 The plum-crowned Pionus was especially sensitive to aspergillosis when imported in the early 1980's, and this is considered the main reason for the demise of this species in captivity. 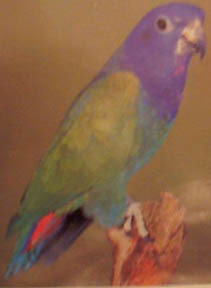 Temperament: This species is very similar to Senegal parrots, a close relative. They are known to be very easy to take care of, with very calm and gentle personalities. They can be skiddish around strangers and in new situations, but they would rather run away then bite. They make great first birds because of their relative low noise, low mess, low destructive capability, and smaller size. Plus they are very cute birds! Cage Requirements:	20" x 20"; bar spacing 5/8"
Temperament: Though they come from a fairly reserved family, these birds are outgoing and playful, and do well with regular handling. They can be a bit bossy and aggressive if not disciplined appropriately, but they can still make good first birds. They are very intelligent, and need a good size cage with plenty of toys to prevent boredom. Cage Requirements:	20" x 24"; bar spacing 5/8"
Interesting Facts:	In most subspecies of Moustached Parakeets, the males have red beaks and the females have black. Temperament: Though small birds, parrotlets are very bold and mischievious. They have no fear and may try to aggravate other animals. If not handled regularly, they may become very aggressive. They can also be very affectionate, especially if you offer to give them a head-rub. Though only about 1/20th the size, most people compare them to amazons! Cage Requirements:	18" x 18"; bar spacing 1/2"
Interesting Facts:	The parrotlet family is by far the smallest parrot family in the world. They weigh about 3/4 the amount of a budgie, and 1/2 the amount of a lovebird. The male and female Celestial parrotlets can be told apart as soon as feathers start growing in. The males have blue on their wings, back and around the backs of their heads. The females may have a light blue right behind their eyes, but are green otherwise. Temperament: Lories are very playful and physical birds. They love to be scratched, wrestled with, and enjoy playing with many toys. Their voices are very high pitched, though relatively not very loud. These birds are incredibly active, and need a large cage to contain their energy. Interesting Facts:	Lories have very long tongues with a brush tip on the end. They use this to extract nectar, a large part of their diets, from many different plants. When the bird is in captivity, its normal pelleted diet needs to be supplemented with a dry nectar, of which many commercial brands are available. Natural habitat:	Forested plains. Birds go on foraging excursions to sparsely wooded savannas and to open country. Description Overall color grayish brown; males have bright orange-red breasts and abdomen while hens have only a hint of orange coloring; the eyes of young birds are dark, changing to orange in adults. Temperament	Like the other small Poicephalus species, these birds are playful and enjoy being handled. They are very good talkers and mimics, and easily learn to perform tricks. Energetic and bold, these parrots enjoy a variety of toys and exercising on a playpen. These devoted birds should be handled by a variety of people to avoid their becoming one person birds. They are also well suited for apartment dwelling due to their small size and quiet nature. Interesting facts	These relatively small parrots seem to be unaware of their size and have been known to attack much larger birds and other household pets such as dogs and cats. 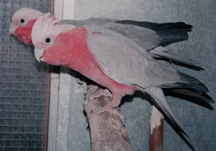 Temperament: Rose Breasted Cockatoos are much easier for most owners than the other cockatoo species, as they are less demanding and require less time out of the cage. They are outgoing and playful, yet will calm down enough for a head scratch. Scratching under their beaks will make them most appreciative. While these birds are easier to own than the other cockatoos, they are still not for everyone, so some research is necessary before purchasing one. Cage Requirements:	24" x 24"
Interesting Facts:	Although very rare in the United States, these birds are more than prevalent in Australia. Many farmers treat these birds as pests and will often shoot them! It sounds bad, but for the farmers, 10,000 Rose Breasted Cockatoos can mean devestation to their crops. Temperament:	These are very commonly found in pet stores and homes. They are incredibly active and playful, yet can calm down enough for a good head scratch. They are affectionate with their owners, but sometimes shy or aggressive with others. They can be unpredictable - sweet one minute, and bite the next. A bird that should only be owned by an expereinced handler. They are notorious chewers with their large beaks and very active, so many toys and a large cage is necessary. Temperament: These playful and independent birds enjoy climbing, chewing and playing with their toys. Their curious and friendly nature makes them good family pets, although they should be handled regularly to ensure they remain tame. The relatively small size of these birds and their quiet nature make them suitable for apartment living. They can learn to speak many words and can be taught to perform tricks. Senegals are one of our most popular slightly larger birds, and for many good reasons! Cage Requirements:	20" x 20"; bar spacing 5/8" or 3/4"
Interesting Facts:	Although these birds are relatively small parrots, they seem to be unaware of their size. They have been known to attack much larger birds and chase other household pets such as dogs and cats. Temperament: Hand-raised cockatoos make exceptionally loving pets. They are both friendly and intelligent, and are very social, affectionate creatures. Natural chewers, cockatoos must be provided with branches or strips of wood. Some birds can be quite noisy, especially during the early morning and evening hours. 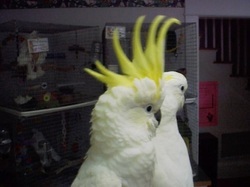 Sulphur Crested cockatoos may be less prone to developing behavior such as feather plucking and screaming than other popular cockatoo species. However, these birds have a lot more energy than species such as the Umbrella Cockatoos. Cage Requirements:	24" x 36" for Lesser's and Citrons, 30"x 40" for Greater's and Tritons. Interesting Facts:	There are five major types of Sulphur Crested Cockatoo: The Lesser, Citron Crested, Eleonora (or Medium Sulphur Crested,) Greater Sulphur Crested, and Triton Cockatoos. They all have very similar personalities, though the smaller 3 are known for being a bit more high-strung. What separates them from the other cockatoo species are their tall, narrow crests which are yellow in all but the Citron Crested, which is orange. 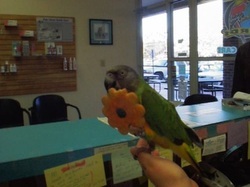 Temperament: Sun Conures are very playful and outgoing birds, and very fun to spend time with. While they do not talk well, they have very powerful voices and are ususally not suitable for apartment living. They will often take a break from playing to settle in for a nice head scratch. Cage Requirements:	20" x 20"
Interesting Facts:	Baby Sun Conures have a very different appearance than adults, and actually look like a different species of Conure, one called a Jenday Conure. Many breeders get these two birds confused, and so people are surprised when their bird molts and turns a beautiful orange and yellow. Temperament These highly intelligent and talkative birds make better family pets than Congo greys, as they are less inclined to bond strictly to one person. Much like the Congos in other respects, Timnehs require regular interaction with their owners and prefer to live in a household that is run by strict routine and is relatively quiet. Interesting facts	Many people have chosen the larger African Grey, the Congo, because of the flashy red tail, a good reputation for speaking and because of being a larger bird. I would like to point out, however, that you are missing out by not having a Timneh. these birds are great, the speak well, and are not at all like the Congo. Temperament: Umbrella Cockatoos are perhaps the most cuddly and physically affectionate parrots on the planet. While most people would find this endearing at first, they soon learn that these birds are perhaps also the most demanding birds on the planet. They would be sewn to your hip if it was a possibility. What they lack in talking ability they make up for in intelligence, as these are birds who can readily learn commands and tricks. Cage Requirements:	24" x 36" for smaller Umbrellas, 30"x 40" for larger ones. Interesting Facts:	Umbrella Cockatoos are named for the shape their massive white crest feathers take on when fully exposed. They are also known for covering their beaks with feathers to let anyone near by that they are so friendly, it appears they don't even have beaks to attack with! Temperament: The Caique is intelligent, curious and energetic. They are quite mischievous and can be destructive if not provided with appropriate toys. Caiques are acrobatic clowns who enjoy hanging, tumbling and rolling. Providing a well equipped playpen will help focus some of the energy in these birds. They can be noisy and have a shrill whistling call. Interesting Facts:	Many caiques develop the odd habit of sleeping on their backs - they look quite dead until they suddenly scramble up to greet you! Temperament: Like the other pionus, the White Capped (or White-Crowned) is known to be shy in new situations, but in familiar places they are very affectionate and loyal birds. They are one of the easiest birds to care for, as they are quiet and not very destructive. They are prone to being lethargic, so be sure your bird gets plenty of interaction and time out of the cage. Interesting Facts:	All Pionus, even the darker blue and bronze ones, have red vent feathers (the feathers underneath the tail, at the base.) They range from bright red in the maximillian's to dark red in the Bronze-	wingeds. Temperament: This type of lory is very active and clingy with their owners, and spend much of their days playing inside their cages. They are not ordinarily aggressive, and not very destructive, as their beaks are very soft. Lories are known to play on their backs and hang upside-down in their cages. They are messy, but their outgoing personality more than makes up for it. 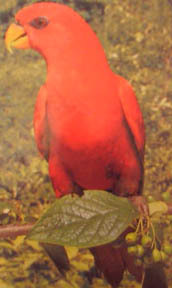 Interesting Facts:	Many national parks in Indonesia and Australia, where Lories are found, have places for Lory feeding. These places supply nectar for adventurous travelers who would like to see the Lories up close. Within minutes, the person is covered in Lories trying to find something to eat. At least a dozen of these places exist, each with many types of Lories and Lorikeets.